RESPECTED indigenous elders have painted a bright picture for the region in terms of cultural acceptance and reduced incidents of racism. 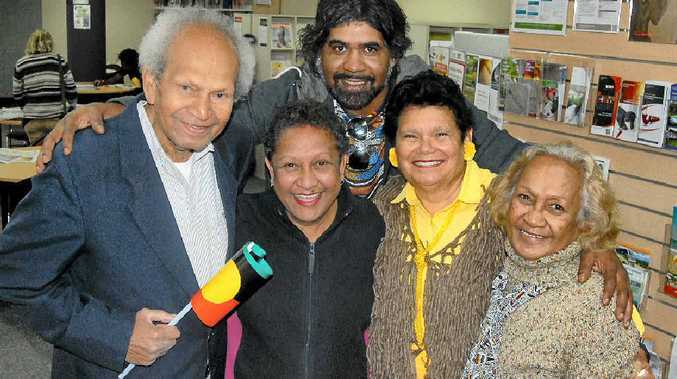 The senior community members have put aside past experiences with racism and and personal family histories arising from the stolen generation to live today with optimism. "It's much easier now than it used to be when I was at school," long-term local resident Auntie Karen Miller said. "People don't judge you as much by your colour these days - we're all people now." The views were shared at the launch of NAIDOC Week outside the Sunshine Coast Council chambers at Nambour yesterday. The event is designed to celebrate Australia's indigenous history, culture and achievements. Indigenous resident Corey Costello-Czok suggested that racism was still present locally, but was largely now "behind closed doors" or within certain groups. As a child, he was told to go home from school to wash himself, but believes that attitude has changed. "The community is supportive of everyone's goals in life," Mr Costello-Czok said. Bianca Bond, the chairwoman of the Sunshine Coast Indigenous Network, said the local community was "nice and hospitable" towards indigenous people, who benefited from a strong network of organisations working to make a difference. "There is a change in the atmosphere, and people want to know more about our culture and our local knowledge and the truth of history," Ms Bond said. Sunshine Coast Council introduced a Reconciliation Plan in December 2011. It honoured a commitment to fair and equal opportunities for the indigenous community. "It's about trying to build respect and opportunity and also to build capacity in our indigenous community so they can take advantage of opportunities," Mayor Mark Jamieson said. "This to me is about seeing progress and ensuring that everyone is given an opportunity. "NAIDOC Week is about recognising the achievements of our indigenous and islander community."